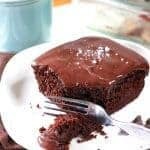 The Best Ever Chocolate Cake; A 1 bowl wonder! 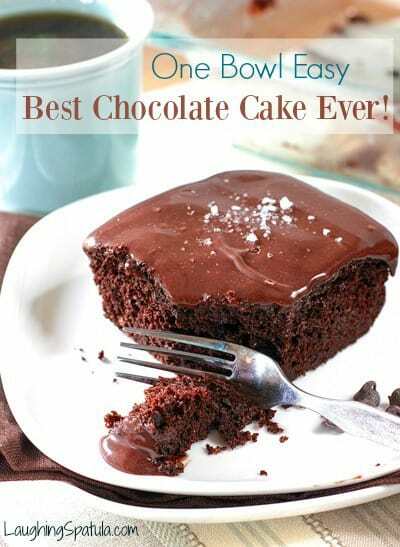 You are here: Home / Cake Recipes / The Best Chocolate Cake! The BEST Chocolate Cake- Topped with ganache and a tad of sea salt- yum! This is the second time I have made this, the first batch didn’t last long enough to take pictures. I don’t know who ate it, I just woke up the next day and it was gone. mmmmmm, hate that when that happens. This time, I snapped a few pics before it went AWOL. You can see by the cake pan in the background that it narrowly made it. My very first ‘pour shot’! Next time I’d probably clean up the counter behind it :)…. but it sure was fun to take! Oh boy you can almost taste that creamy perfect ganache…. Save a cup of coffee from your morning brew and whip this up. I should mention there is no taste of coffee, it simply enhances the chocolate flavor – your family is soooo gonna love you! Need more cake? …and who doesn’t? Here is a grown up version of this same easy recipe! It is killer and your friends will love you. Made your in laws mad? Husband cranky? Mend EVERYTHING with this cake. For real. 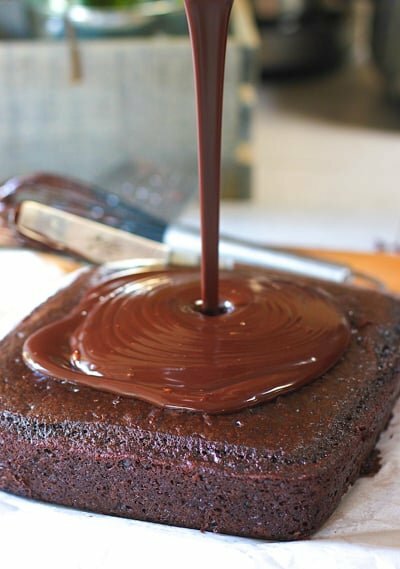 Double Chocolate Whiskey Cake with Whiskey Ganache ! Don’t let the ingredient list scare you, it’s only long because I included the recipe for an 8 x 8 AND 9 x 13 pan. Because sometimes you need a little cake…and sometimes you need a lot! Hi! I wanted to know if the cake is going to taste a little on bitter side with the addition of coffee? I’m making this for kids, I want to make sure that they don’t taste any coffee flavor in it. Hi Ayesha! – no coffee taste at all! All it does is intensify the chocolate flavor. Taste a lot like the dense kinda chocolate cake we had as kids! (or I had has a kid…depends how old you are LOL!). How long will it last/keep? Should I keep it in the fridge if I make it two days in advance of the celebration? Hi Stella – this has a pretty good shelf life. Probably 4-5 days. I store mine in the fridge because I like it cold and it cuts better. Just made this delicious chocolate cake and had it for supper. WOW! Just like my Grandmother’s German Chocolate Cake . Wasn’t dry at all and soooooo chocolaty. Will be our “go to” chocolate cake from now on. Would you be able to please tell me approximately how high this rises? I need to make a layer cake this size, and wondering if one cake can be cut horizontally in half or if I’ll need two. I see you spoke about doubling the recipe further up; so maybe that would work however my pan is only 5cm high (2 inches) – wonder if that would be high enough? Thanks for your help. Hi Kathryn – 2 inches is the standard height of most cake pans and will work fine. Inside the recipe card there is a recipe for an 8 x 8 or a 9 x 13. Hope that helps! Is the sugar mentioned in the ingredients powdered sugar? White granulated sugar. Sorry, I need to be more clear on that! I updated the recipe. Thank you! I’m making this today for my husband’s birthday 😀 Will let you know how it turns out! Yay! I am so glad, it’s my favorite cake! Hi, hi I’m looking forward to making this for when my sister’s visit at the weekend. Hi Pat! I don’t think you will be disappointed. Just be sure to use pretty good cocoa and chocolate. Hersheys will do but stay away from off brands. Have fun and hope she loves your cake! I love this cake! My house smells amazing when it is baking. The hardest part of this cake is waiting for it to cool to frost it. My husband wants to take a piece right away. Hi Nancy! This cake is amazing! I want to make it for everyone I love! Did you end up doubling the recipe? I have not doubled it yet. I was thinking of baking it 40 min when I do. I’m making the frosting now for the 8×8. The hubby was able to hold off a piece while it cooled! I think this cake would be hard to over bake, it is so moist. 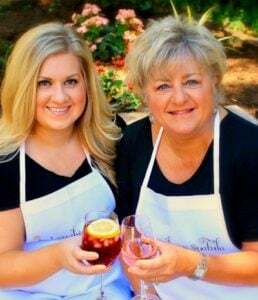 I am making it for a big party so will need a couple 9 x 13 pans. Holy chocolate! Lets share if one of us doubles the recipe…I got a feeling it will work just fine! Would it be possible to double the recipe and bake it in a 9×13 pan? How long would I bake it? I love this cake and would like to make it for a large group. Thanks for the nice comment Molly! This really does look like the BEST chocolate cake ever! I love the ganache and also the splash of coffee. Can’t wait to try it!